Those who run, tend to run often and are passionate about running. Mile after mile, week after week, this repetitive stress and impact on the body can cause many pains and injuries throughout the body. While running has immense benefits for the heart and the soul, running can also cause lower back pain. For runners who already have back pain, running could make the pain worse or could lead to sciatica, leg pain or weakness. For back and lower back pain treatment, contact Divine Spine for computerized treatment. Back pain can be severe and waiting for treatment could make it worse and lead to other body injuries. If you are a runner, learn more about how to prevent back pain and contact Divine Spine if you need computerized treatment. 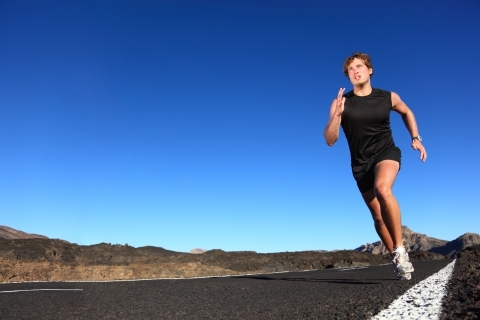 Back pain from running can be caused by poor running form. A lack of hip mobility can be the culprit of lower back pain. When a runner is not as flexible in this area, it limits mobility while running. When there is limited mobility in the hip, the pelvis can often end up rotating too far forward or too far backward, which causes additional stress on the spine. Back pain problems for runners can also be caused by weaker core muscles. When you’re running, you may not notice that your core muscles are engaged because the strain is felt in the legs. However, a strong core will aid in a better running form which can help prevent lower back pain. See our blog on Yoga Poses for Stronger Abs, Yoga Poses for Back Strengthening and check back later for exercises that will help improve your core strength. If you love running and are passionate about running, you’ll want to follow these tips to help prevent lower back pain, especially if you have had back pain in the past. Doing a thorough warm-up before a run is essential in preventing back pain. This will warm up your muscles and prepare them for repetitive impact. Stretch your hamstrings, the muscles in the back of the thigh. Do this both before and after your run. General muscle strengthening will also help prevent back pain. Cross training, or doing a variety of activities will ensure that all of your muscles get the exercise they need. Wear shoes that are both comfortable and supportive. For advice on the best shoe for your foot, find a local running shoe store. Be mindful of where and on what surface you are running. Try to run on softer surfaces, such as grass, or a rubber track. Running on a harder surface like cement will add to the impact. If you are experiencing lower back pain or general back pain, contact a practitioner at Divine Spine for back pain treatment. Getting the treatment you need before it causes other severe injuries is important, so contact us as soon as you begin experiencing pain. Wellness treatment shouldn’t be a last resort when it comes to back pain. Contact Divine Spine today and learn how we can give you proper treatment and relief for your lower back pain.